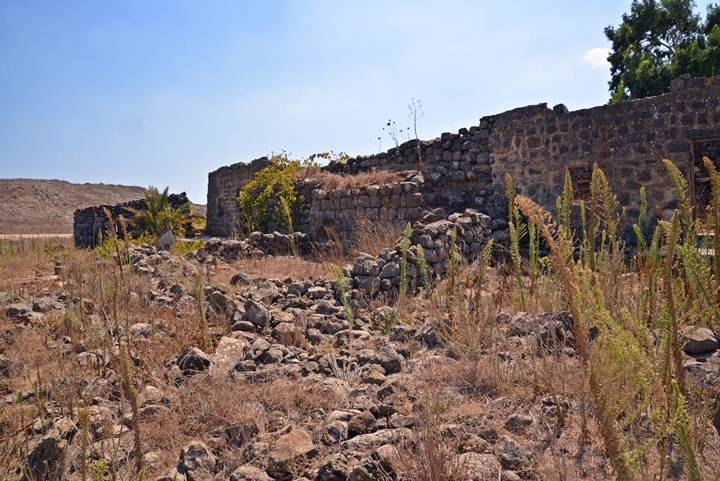 Ruins of a 13th Century Mamluke Khan in Ramla. The ruins of a 13th Century Khan (inn) are located in the outskirts of Ramla. This Mamluke structure once served the caravans and travelers along the main roads of the central area of the Land, an important station along the Mamluke postal road. 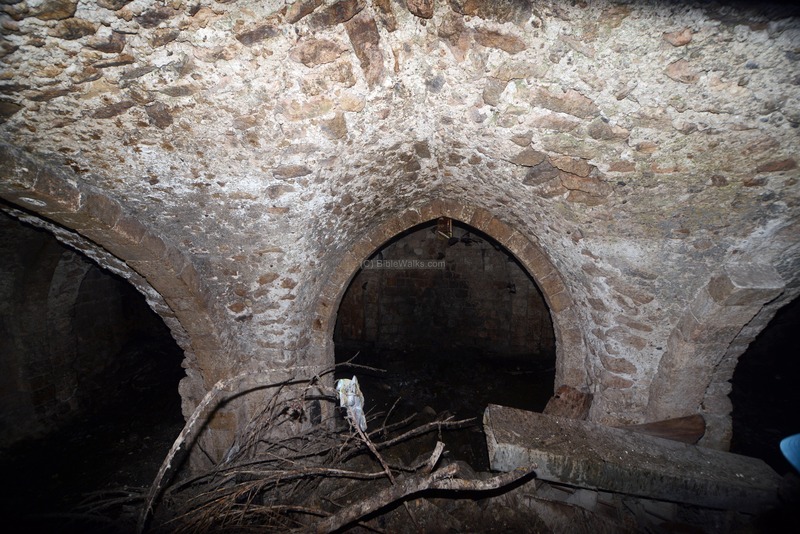 The site is in a very neglected state and hopefully one day the place will be restored. 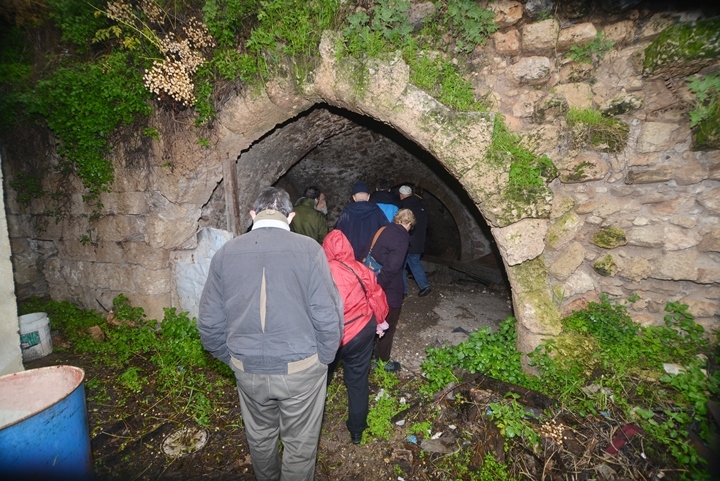 The site is located on the south east side of Ramla, on 13 Menachem Daniel street, near Yosef Klausner street. 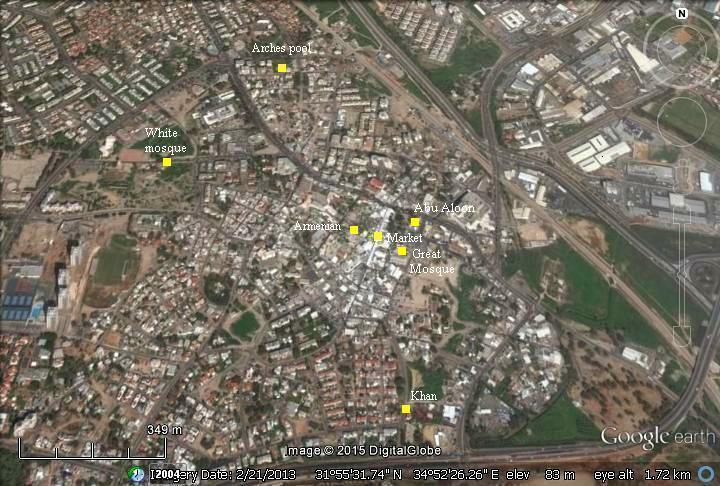 You can point on the yellow squares in order to navigate to the selected point in this page and other sites in Ramla. The Mamlukes were Turkish prisoners who were sold to the Sultan of Egypt, trained by him and served as his palace guards. In 1250 they seized the control of Egypt, and defeated the Mongols (1260). The Khan was constructed during the Mameluke period, and was an important station on the crossroads of major trade routes. It was named Khan el-Azzam ("the great inn"). It was built on the side of the Mamluke "postal" road from Cairo to Damascus. This road was initiated by the first Mameluke emperor, Bybars, in 1268. It served the Mameluke empire until the 16th C.
The postal road enabled a fast connection between Cairo and Damascus, a journey taking only 4 days, thanks to the quality of the road and the stations along it. There were dozens of Khans along the road. Examples of other stations along the road are Orkha (Juhadar) in the Golan, Qaqun, Jaljulia, Erani, and Benjamin's tomb in the Sharon. Rabbi Meshullam Ben-Menahem (Manuelle de Volterra), a 15th Century Jewish Italian traveler, traveled here on August 26, 1481. He reported in his travel book ("Bonaventura di Manuelle de Volterra") that he stayed one night in the Ramla Khan. He described its function as Fonchi or Foneco (meaning: Inn, caravanserai), as a station on the road from Egypt to Damascus. The inn was later converted to a ceramics workshop, and renamed "Khan el-Fukhar" meaning the inn of the clay vases. North to South: top right (from Damascus) to lower left (to Cairo). "In the subsequent centuries it is often mentioned as the resting-place of pilgrims and travelers on their way between Yafa and Jerusalem. About 1547 Belon found it almost deserted, scarcely twelve houses being inhabited, and the fields mostly untilled". 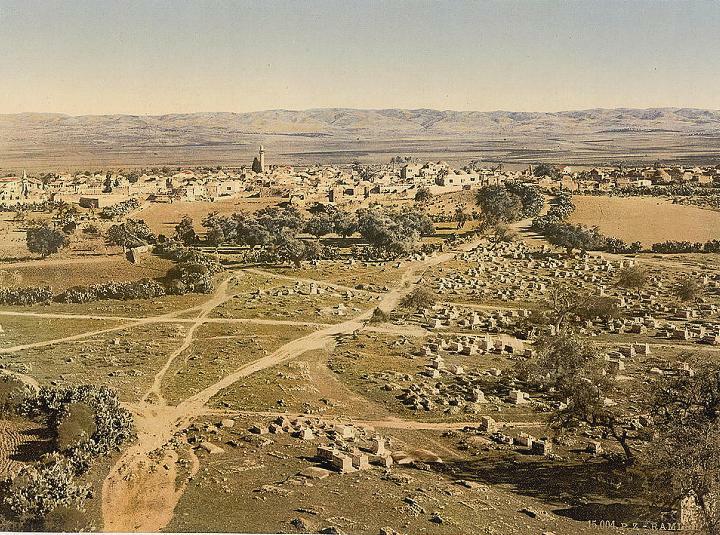 An old 19th Century photo of Ramla is seen below, as viewed from the west side, captured on top of the tower of 40 martyrs. The main road from Jaffa to Jerusalem is seen here in the center, passing thru the city. The khan was located on the other (south east) side of the city, on the south side of the road. Today this historic site is in a bad shape, hidden behind a workshop for agriculture machines. Only the bats nesting inside the vaults enjoy it. This is sad, and we hope the municipality and the IAA restores the place and opens it up for visitors. The ruins are located on the east side of a metal workshop that manufactures and repairs agriculture machines. The owner, Yehuda Mordechai, helps to keep the site from looting, and receives our credit for this. 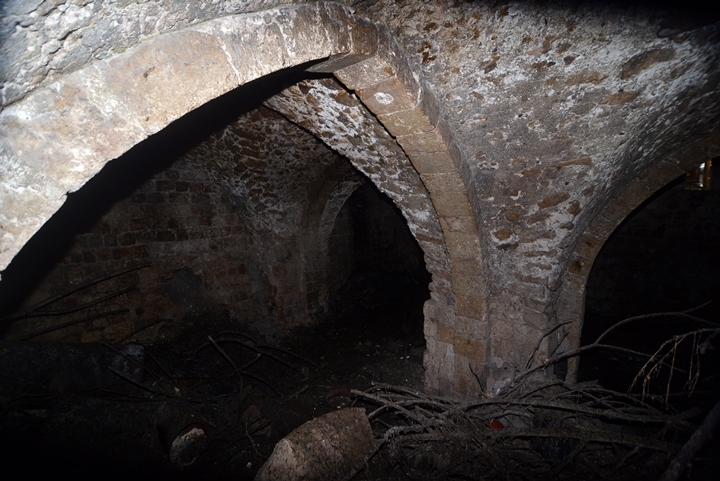 The Khan is built on vaults - arches that support the ceiling and roof and provide a covered space. The halls and the courtyard provided shelter and supplies to the travelers and their horses and camels. Dr. Yigal Sitry tells about this site. 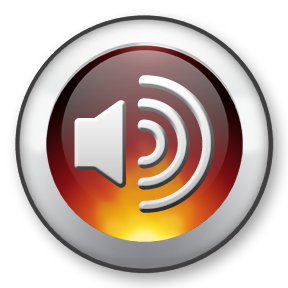 You can listen to his story in Hebrew, recorded live and uncut, for 6:37 minutes, by clicking here. 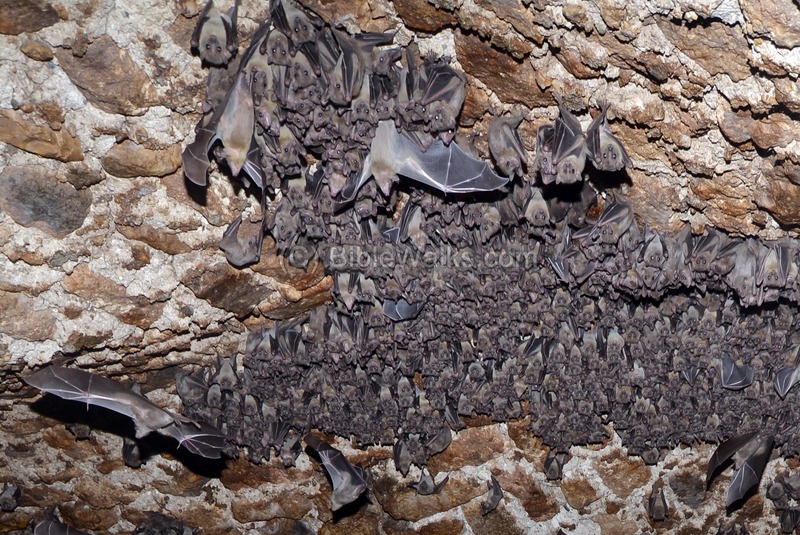 There are thousands of bats living in this artificial "cave". 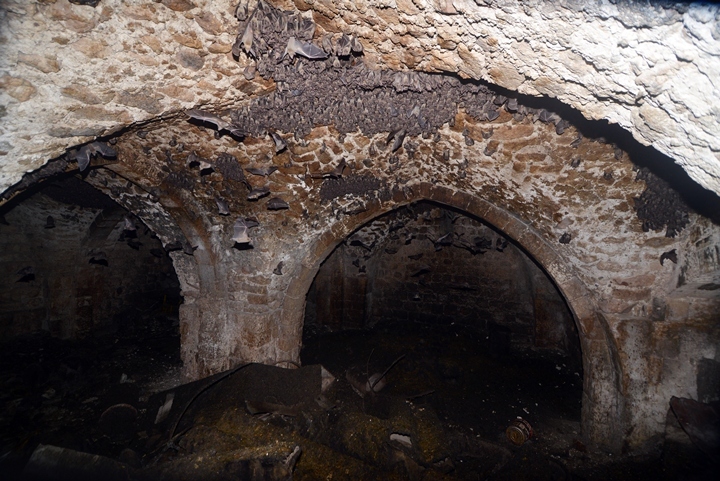 You can see clusters of the bats clinging from the ceiling. They fly around in the vaults , while shrieking with a high pitch voice. The following photo shows a group of bats clinging to the ceiling, each bat tug against its neighbors. Some of the bats are in flight or preparing to fly. As they use pulsed sounds to measure the distance to objects, the bats avoid obstacles, including us... You can see and listen to the bats in this Youtube short clip. Tagliot - "Archaeology for All" (Hebrew site) - arranged the tour, which was guided by guided by Dr. Yigal Sitry, director of the Ramla museum.